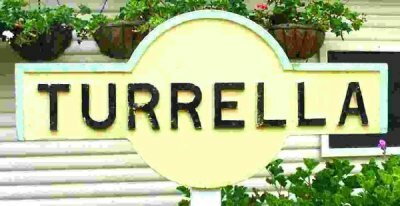 TURRELLA is the name of the main station and terminus of the tramway. This station is the most impressive on the railway with its 3 terminal roads, Normanton style station canopy, signal box, sandstone colonnade, viaduct, and sub way tunnel portal. As well the Adjacent Railway Hotel, station carpark and monument to Turrella Tramway’s historic first locomotive, “The Turrella Thunderbolt” make for an striking vista. Turrella is linked to the rest of the tramway via Fossil Point Bridge. All trains commence their journey from Turrella to either Bigglestown, Luddenham, Coal Creek, Girlieville or back to the maintenance and locomotive stabling facilities at Loco Shed. Turrella Terminus was also built with a subway line planned as a future addition. The subway would be operated by an over head pantograph electric tramcar set.